See graphic below. 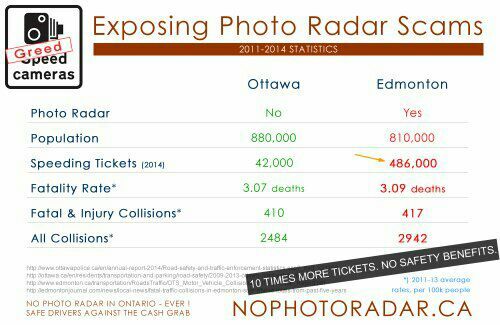 Similar stats for Wpg and other places with Photo Radar. Ottawa City Council has vote on Photo Radar May 4 2016 and looking for public input. Hope they dont fall for the improved safety propaganda and promises of huge revenue that was pushed by ACS & WPS to Wpg & MB Politicians & officials in 2003. It proved to be false in 1st 2 years when little money left after paying ACS. They got greedy and expanded fixed and mobile PR, created and stopped fixing traffic engineering deficiencies to issue more tickets and worse. Now the public fed up and courts back logged 18 months, Crown bribing with half off offers and staying tickets when any one with the facts contests to prevent exposing scam. I have seen this 1st hand. Is this behavior legal? Share this and when enough people fed up they will have to have to listen. This entry was posted in News and politics, Sustainability and tagged Abuse, acs, ACS Government Solutions, manitoba, photo radar, scam, winnipeg, xerox. Bookmark the permalink.